Hand mirrors were an important part of a dresser set. Picture a Victorian boudoir and you probably imagine an antique brush and mirror set somewhere in the room. These beautiful sets are eagerly snapped up by collectors everywhere. Antique dresser sets can consist of numerous items from trays to hair receivers. The brush and mirror set was simple, just a hairbrush and a mirror. It was available to not just the wealthy households but to the rising middle class woman as well. These sets were treasured heirlooms, lovingly kept and cared for. These sets were popular as gifts and were often given to the new bride. Sometimes babies were gifted with small brush and mirror sets as well. The brush and mirror sets were made from a variety of materials and included numerous design possibilities. While these sets became increasingly available during the Victorian age (1837 onward) most of the sets that you will find were made between 1885 and 1930 or so. 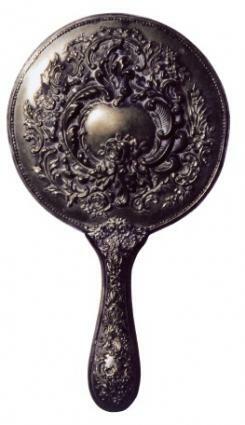 The earliest hand mirrors were used by the Romans who introduced them to Europe. These mirrors were a metal disk with a handle and the face was polished so it was reflective. There would often be designs added to the back depending on the wealth of the owner. During the 1500s craftsmen in Venice began to make glass hand mirrors. They would cover the back with a mixture of tin and mercury. This was used up into the early 1800s and, for the most part, only wealthy people had access to these sets. During the 1840s silver began to be used instead of the tin and mercury and they became more widely available. However, most sets were imported from Europe. It wasn't until 1854 that a man named Hugh Rock took out the first United States patent for the hairbrush and the sets began to be manufactured in the United States. Jasperware -This beautiful jasperware set features a woman being kissed by a cherub. Notice the fine detailing on the silver handle. Green Celluloid - This beautiful celluloid set has Art Deco lines and gold handles. Jeweled Set - Made from glass jewels and brass filigree this set reflects the glamour of the 1930s. Enamel Set - Both a guilloche and hand painted enamel techniques were used to create this beautiful set. Porcelain - This beautiful porcelain-backed set has a floral theme. These sets can be found in almost any antique shop in any town. Look for sets that come with the original box because these are often worth more. Examine the set carefully for scratches, chips, or nicks. If the set is silver pick it up and check for weight. Some antique style sets made in recent decades are made from hollow metals and will be very light. It is easy to care for antique brush and mirror sets. Keep them dusted and wipe down with a damp cloth as needed. Display them on an antique dresser with the mirror side down to keep it protected and try to keep them out of direct sunlight which can cause fading or cracking in some materials. If you have a tortoiseshell set you may want to gently use some wax on it to keep it moisturized and in good condition. Displaying these unique sets in your home can be addictive. Once you find one that you love you may be on the lookout for more to add to your collection.